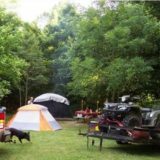 Large, private river-front campsites on the James River near Natural Bridge. We welcome individuals, families, groups and pets. Seven primitive tent sites. $35-$70. Pets Welcome, WiFi.